So yesterday Lily showed me and Sabine where the gate to the University was. It led out to Nanhu Street where we could catch a taxi. I know that I’m not going to remember the Chinese name of the gate so I took a picture of it. I thought that if the worst happened and I got completely lost, I could show the driver where the gate was and he could find it since I don’t speak a word of mandarin. Come to find out I took the photo right at the time that two of the foreign teachers on campus were walking by. Edwin and Mary were on my list of contacts that I was supposed to find when I got to campus, and I met them completely by accident. I asked Mary where they lived as she was hurriedly crossing the street and could only understand the apartment number, but didn’t know what building they were in. Today I found out they live in my building of all places and just two floors below me. Edwin gave me the address and when I stopped by this afternoon, Mary offered me a glass of sweet iced tea. It felt just like home. Then tonight on my way back from dinner with some friends (I’ll introduce you to them later), Ethan asked me where I went to college. I replied “Oh, it’s a small Christian school in Tennessee, I’m sure you’ve never heard of it.” The six degrees of separation thing is really true, he has a friend of a friend who went to Freed Hardeman on a running scholarship. How insane is it that I met a complete stranger from Wisconsin who has heard of a college in Henderson, TN with under 2,000 students. Z-University has more teachers alone than the entire student body at Freed. Today was a really busy day. Lily picked me up at 9am with a car and driver and Yoshita (the Japanese teacher) and myself headed to the hospital for our physical examinations required by the University. I was very blessed in that the paperwork I brought from my full physical in the U.S. was deemed sufficient and I didn’t have to be seen by any Chinese doctors (which I’ve heard is really scary compared to western medicine). While there I saw Shannon, another foreign teacher from my group in the U.S. She has not even seen her University yet, they stayed in a hotel playing cards last night. I’d rather be out exploring. 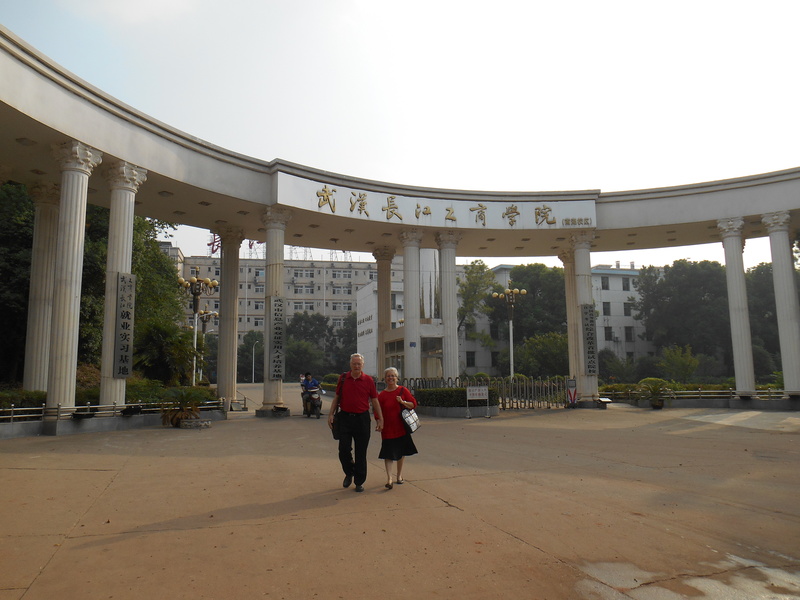 After the hospital Lily helped me set up my bank account at the Bank of China located on campus where my direct deposit will be placed and I was able to exchange money. 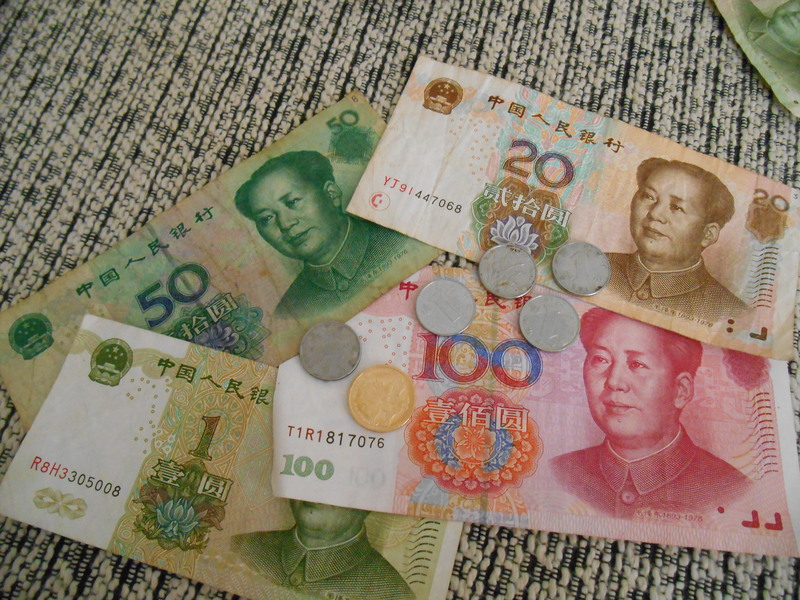 The Yuen to Dollar ratio is 6:1 so it felt like a whole lot of money when they handed me back my bills. There are no lines at the bank, you take a number like at the DMV and it takes just as long. There were 37 people in front of us, but I made it through the V.I.P. line. Lily found a clerk she was acquainted with who got us a spot in line with only two people ahead of us. It still took 45 minutes to get to a teller. I can’t imagine waiting in the regular line, then again this is China. I got a SIM card for my cell phone through China Mobile, one of the three cell phone carriers in China. It cost me 50RMB (aprox. $8.00) and includes 30 min call time, 100 text messages, and 500mb data then a per minute rate after that. I’m still pretty confused about that one. For lunch we went to the street vendors and I got the equivalent of Chinese garlic bread (minus the garlic) and a Honey Lemon Tea, both of which were delicious. Lily asked me if I knew my way home and pointed at a high rise. “Your apartment is over that way, you find it, okay?” I replied that I could and we parted ways. I did… eventually. At least I’m getting my exercise. Oh, by the way that’s how I met Ethan today. I was walking up and down roads trying to find my apartment and I heard some guys speaking English. I walked down to the foreign teacher apartments they were walking out of and introduced myself. Spencer is a Chinese student and Ethan’s guide. It’s his first year here too. They said a group of foreign teachers were meeting for dinner and invited me to go with them. I got their cell phone numbers and promised to meet up later then texted Sabine to come as well. 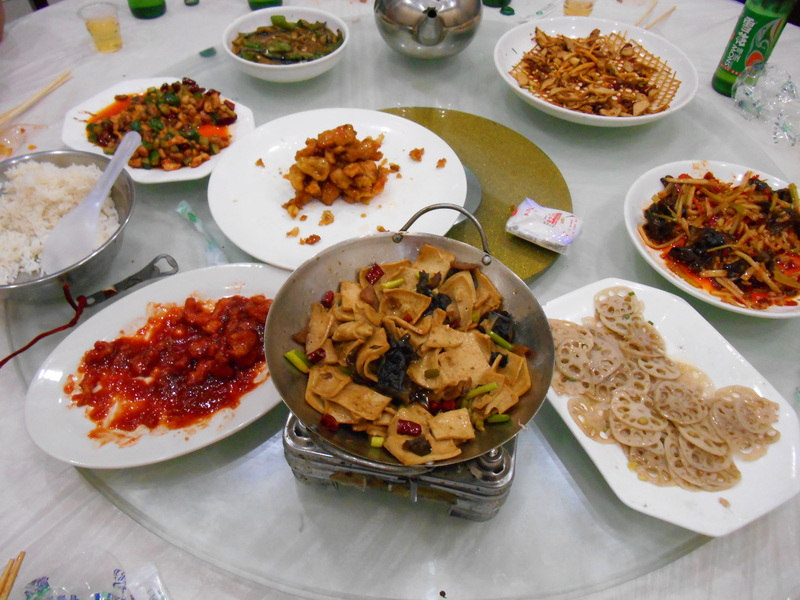 In China food is served family style and all the dishes were delicious. They were also written on the menu in Chinese characters so without Spencer we all would have been lost. Of the 13 English teachers on campus I have now met 8 including myself. Not bad for my second day in Wuhan. My favorite dish was the one in the middle. It was a fried sweet potato covered in candied sugar. Delicious. 1. All who wander are not lost. I got lost and it helped me make new friends. 2. I got great advice on class rules for my students. Never give out your cell phone number, students will blatantly cheat… just expect it. 3. Every foreigner will get indigestion, but accordeing to Mary eating eggs can help build up your immunity. Previous Post Coolest day Ever!!! everyone has enjoyed each of your newsy letters. We keep them in a binder on display. sorry I missed your call maybe next time. Glad things are going so well. The guys will be leaving for Africa very soon. Temperature 95 + every day. Everyone sends their love. I’m so glad everyone is keeping up with me. I would love to know how things are going back home. I hope the guys have fun on their trip. It sounds like it will be an amazing experience. I know that some of my friends back home do not have email access so I’m glad you are sharing with everyone. I will try to call again soon. Hi Chrissi. Let me echo the comments of Juanita. Your posts read like they were written by an ENGLISH TEACHER!! Thanks for keeping us up to date. It’s so good to hear from you. Please keep writing to me, I love to have a little piece of home. I have met many family members here it’s amazing. This is truly what it’s all about. Everyone that is teaching English in China is here because they want to be here which makes it a really cool experience with like-minded people.